In terms of population, the municipality of Isperih is ranked in the first third of all the municipalities in Bulgaria with 22,455 inhabitants and 23 settlements ( 1 town and 22 villages ). Fire villages have between 1,000-2,000 inhabitants, 8 villages - from 500 to 1,000 inhabitants and 9 villages - less than 500 inhabitants. In the municipality center - the town of Isperih live 40 % of the population. The gander distribution of the population is even. In the town, the population of women is higher by 2,2 %, but in the villages a relative parity exists. In the town, the population of men above 55 years of age is smaller by almost 12 % compared to that of women and it the villages it is over 10 %, which is due to the earlier mortality rate among men. 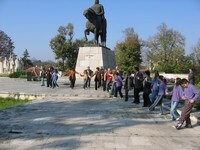 The cultural life in the Isperih municipality is influenced by the rich cultural and historical heritage as well as by the community centers, which organize amateur art activities; 23 such community centers are functioning in the region. Community centre “Saznanie”, Isperih comprises 11 ensembles with 150 amateur artists, which participate in events in Bulgaria and abroad: Mixed choir for tourist and patriotic songs, Youth and children’s dance ensembles, Children’s music school, Children’s school for modern dances, Brass band, Folk company “ Zen-shen”, two children’s vocal groups. 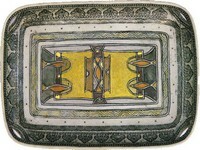 In vilage Malyk Porovec the local artist - ceramist Svetlozar Parmakov, make by hand coloured chinaware. Each creation is made by hand and is unique. The pictures of his products on this pages give you representation of his work, but not allow you to see the fine finish that is applied and fired at very high temperatures to produce these porcelain pieces.